Our big win in the 2009 “Roberts v. Tishman Speyer” case is now a prized target of the landlord lobby, something they want tenants to trade away in order to renew and expand rent protections. In order to strengthen their hand, the State Senate Housing Committee just passed – on a party line vote – a bill to repeal that landmark decision. Along with our Assembly Member Brian Kavanagh and our Senator Tom Duane, I have made it clear: this hard-fought victory must not be treated as a bargaining chip. Despite the sky-is-falling rhetoric from the industry, gutting the Roberts case would do little more than reward behavior that was contrary to law. By way of background, the Court of Appeals ruled in Roberts that Tishman Speyer and MetLife were not allowed to deregulate units while receiving the J-51 tax abatement. The Court did not, however, determine the precise damages, and sent that question back to the lower court. From the beginning, landlords have claimed that Roberts would unleash a fury of lawsuits in other communities, throwing into doubt the appropriate rent on tens of thousands of units that receive J-51 tax benefits – and sticking them with millions in damages that would hinder them from being able to maintain their buildings. In fact, there has been no turmoil. Although owners deregulated about 40,000 apartments in J-51 buildings before Roberts was decided, lawsuits have been filed covering only about 3,000 of those units outside of Stuyvesant Town and Peter Cooper Village. Rather than comply with the ruling by re-regulating apartments or reducing market rents to the appropriate, stabilized levels, many building owners are choosing to run out the clock on the statute of limitations. Every month that passes gets landlords that much closer to enshrining the illegal rent as the legal one for all time. From the landlords’ perspective, it pays to pretend like nothing happened. But that’s hardly a compelling reason to let them off the hook and legislate Roberts to death. Even as building owners profit off ill-gotten gains, they want the public to believe that it’s the tenants who are taking what they don’t deserve. They say the renters covered by Roberts are “wealthy” people who “voluntarily” signed market-rate leases and are not entitled to a “windfall.” That’s both highly misleading and completely irrelevant. The Stuyvesant Town and Peter Cooper Village tenants who brought this lawsuit had no choice but to sign market leases; it’s all our landlord offered us. And for many residents who begrudgingly stayed in their homes even as their rents soared, in a city with a vacancy rate of just 3 percent, there were very few alternatives. Remember, landlords had collectively and unlawfully removed 40,000 rent-stabilized apartments from the market – 4,000 in Stuyvesant Town and Peter Cooper Village alone. To now blame tenants for signing market-rate leases takes a lot of chutzpah. Landlords propose getting themselves out of this mess by simply returning their tax breaks to the City. This would let them capture a huge windfall – and completely reverse the 50-year history of J-51 tax breaks, from being taxpayer grants designed to maintain affordable housing, to publicly financed loans used to eliminate affordable housing. Far from offering clarity, this bill would invite new litigation. Because landlords could deregulate J-51 apartments upon returning their tax abatements, rent-protected tenants would lose their long-standing and unimpeachable rights. That would not go unchallenged. The Court of Appeals was unequivocal in ruling that landlords may not deregulate apartments while receiving taxpayer-funded public assistance. To reverse Roberts legislatively would reward building owners for opportunistically, or even deliberately, ignoring the plain language of the law to reap huge profits. There is no defense for that, and the state legislature and Governor must not let it happen. 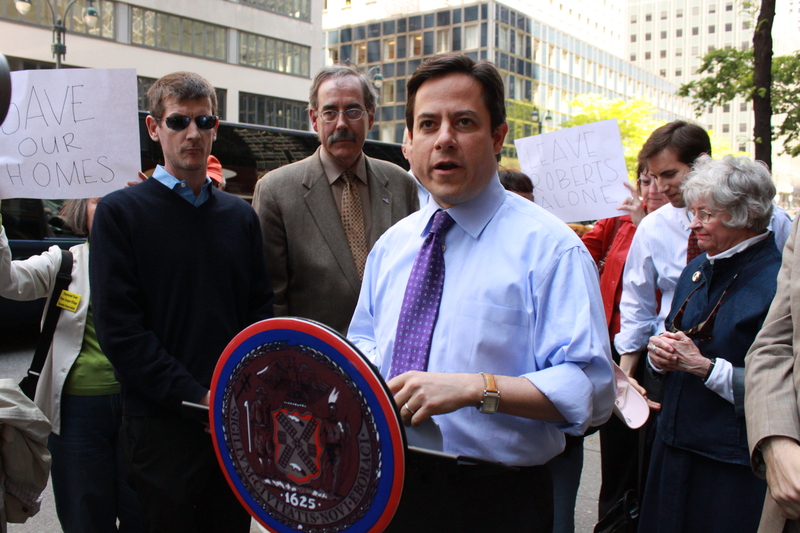 Council Member Dan Garodnick represents Stuyvesant Town and Peter Cooper Village, where he is a lifelong resident, and a member of the class in the Roberts v. Tishman Speyer case.